Large corporations still maintain structured leadership development programs, but most small companies do not. Maybe the formal program got axed as a cost-cutting measure, or your small but growing company hasn’t yet identified leadership development as a need. In either case, it’s time to consider creating a leadership development program. Think it’s too expensive? Consider this: Without a few up-and-comers in the wings, you’ll have to go out and find people with the right skill sets, which ultimately may be more expensive and time-consuming than growing your talent in-house to be ready for when they’re needed. An employee with a diverse skill set has a greater ability to solve problems, build teams and improve productivity – all benefits to your company. Plus, developing current employees demonstrates that you value them, which increases loyalty. Many managers think first of technical skills when considering staff training. Leadership development is beyond that. Yes, you may need to send Samantha to Excel class so she can learn to make pivot tables. But to really get long-term value out of Samantha, you need her to develop into an organizational leader. These managerial skills develop over time, nurtured by a little classroom training, preferably with practice in the form of role-play, supplemented by reading, mentorship and lots of hands-on experience. Before implementing any sort of leadership development program, you must first decide on the skills your organization is currently missing and will need in the future. These skills must be shaped by your company’s near-term and long-term goals. Do a few of your in-house customer service reps need to learn the art of outside sales and contract negotiations? Does your marketing manager show promise in developing strategic communication plans but needs coaching to fully understand the company’s market position? Your training should align with these goals. View leadership development as a process rather than a one-time event. After all, your customer service reps are going to have to go on several sales calls with your top salespeople to absorb and learn before they’re ready to fly solo. Once you’ve identified your company’s skills gap, it’s time to consider which individuals may be best suited to be groomed for a future leadership role. First, talk to the people already in leadership positions in your company. Find out what their dreams are and what skills and experience they believe would help them improve their performance now and in the future. Next, identify those young or less experienced employees who show potential. Once you have a sense of both groups’ development needs, you can set about getting them the necessary training and on-the-job learning. The formal structure of large-company leadership development programs rarely fits today’s leaner organizational culture. It’s simply not practical for smaller companies to send their managers away for a week of classes on a regular basis. Plus, brain science has taught us that people learn better with more frequent, shorter chunks of classroom education. That means four, one-hour sessions work better than a single four-hour training. However, classroom or online training is only one method for developing leaders. One-on-one mentoring, real-world practice of skills, on-the-job training and special assignments with supervision generally prove much more effective for developing a person’s more conceptual, people-oriented skills. In today’s business environment, the best leadership development results from a culture of continuous learning rather than a formal program. This means you let people self-direct their learning, just so long as their training desires match company needs. Technology now provides additional avenues for self-directed learning and knowledge sharing in the form of cloud-based applications. Apps such as Bloomfire, Knowledge Tree, Sharepoint, Slack and Yammer offer your employees a centralized place for two-way conversations, training and onboarding. Called social learning, such apps make it easy to crowd-source questions and answers and give your employees the option to engage in lecture learning. If you want to grow your company without taking a hit to quality or customer service, leadership development training is your answer. Invest today so you can grow tomorrow. Find more tips for building your leadership team. 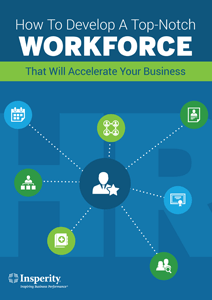 Download our e-book: How to Develop a Top-notch Workforce That Will Accelerate Your Business.